August 30, 2013, Pittsburgh, PA - For many Pennsylvania drivers, back-to-school also means back-to-back traffic, especially if you're caught behind a school bus or crawling slowly through a school zone. Although most drivers comply, the Pennsylvania Department of Motor Transportation reports that over 1,000 motorists are caught ignoring school bus stopping laws each year. But passing a stopped school bus can have dangerous, and pricey, consequences. Violating Pennsylvania's School Bus Stopping Law can result in a 60-day driver's license suspension, five points on your driving record, and a $250 fine. The NHTSA estimates that school transportation-related accidents account for 137 fatalities each year. Pennsylvania law states that drivers must stop at least ten feet from a school bus with flashing red lights and a stop arm extended, whether meeting it head on, overtaking it, or approaching it at an intersection. All motorists must then wait until the red lights have stopped flashing and the stop arm has been withdrawn before moving, making sure children have reached a place of safety. Although the stopping law sounds fairly straightforward, it's no secret that many Pennsylvania traffic situations are much more complex. So how do you know exactly when to stop? The answer is not always clear. On roadways with painted lines. At an intersection, whether it is or is not marked with a stop sign. On roadways with ridged/grooved dividers. A road is divided by a concrete median barrier, metal median barrier, or guide rail. A road has clearly indicated dividing sections such as trees or shrubs, rocks or boulders, a stream, or grass. When in doubt, always stop. You could be saving lives, money, and your license. In addition to stopping for school buses, drivers must be aware of active school zones. Marked with signs indicating their beginning and end, Pennsylvania school zones have a speed limit of 15 miles per hour. If you are caught speeding in a school zone, you could be fined up to $500 and receive three points on your driving record. Do it a second time, and you may risk losing your license for 60 days. Fines and penalties may increase for careless driving that results in serious injury or death. Edgar Snyder & Associates, a law firm helping injured people, advocates safe driving throughout the year. 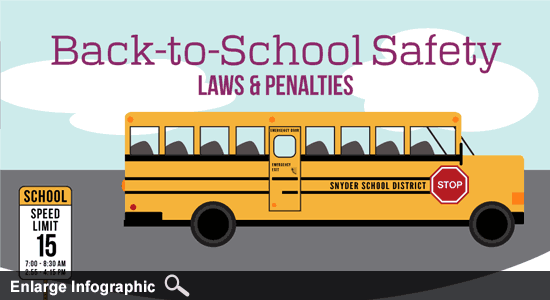 Just in time for back-to-school, the law firm has published a PA Back-to-School Laws and Penalties Infographic that illustrates vital information and statistics to help PA drivers, including an illustrated guide to the road situations where drivers must stop for a school bus. Also in time for back-to-school season, Edgar Snyder & Associates is kicking off the 10th Annual "My Holiday Wish" Coloring Contest. Western Pennsylvania elementary students can enter to win a $1,000 cash donation for their school and $250 for themselves by illustrating their wish for the holiday season.